Born: 1882 in Northboro Ma. Died: July 17, 1959 in Bourne Ma. at 76 yrs, 7 mos, 7 d.
1. Edith Parker Hall Wilbur; (April 18, 1910 – September 21, 2008); Married Homer Edson Wilbur (August 2, 1910 – October 7, 2000) (Marshall Wilbur & Florence Gertrude Fish) in Bourne Ma. 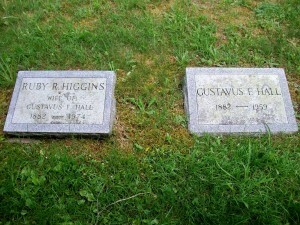 on July 13, 1940; Edith & Homer are buried in Cataumet Cemetery.